Whilst at Stanhope Road (later West Park in 1974 for a short time), there were school trips to the Cairngorm Mountain range in Scotland organised by Mr Dale/McDonald Mrs Ellis (& in 74 Mr McNaughton). The original lads only trip in 1968 (I think) was in primative conditions in the old war time Norwegian Hut - used by troops ready for exploits in Norway during WWII. A first in outdoor education in the borough. Better purpose built accomodation followed for the latter trips which educated us in Ornothology, Biology, Cartography, Mountain Sciences & Geology amongst other topics. In 1973 it was again lads only, but in 1974 we had the joys of female company. Has anyone a copy of the school group photograph taken as we left the school for the 1974 week away I remember we mapped the depth on Loch Morlich near Aviemore and climbed Ben McDhui. I've lost my copy. It'd be nice to see those smiling faces again. Any help appreciated. Apologies in advance for any spelling mistakes -Its freezing and I've Reynauds and poor eyesight. 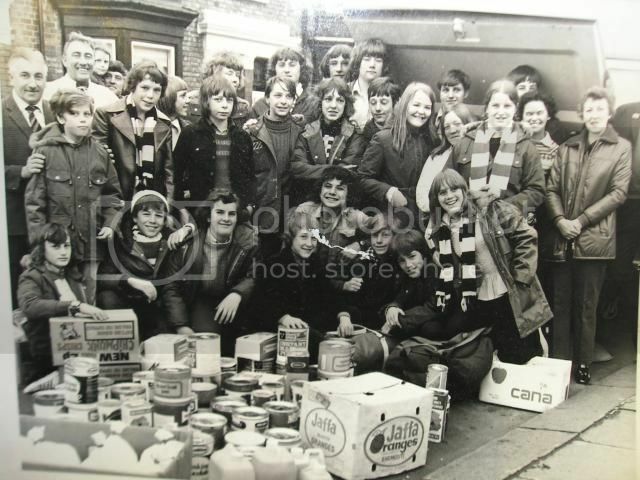 Thanks to one of the members of the trip (Derek Thompson -cheery kid decked in Sunderland AFC colours squatting second from left); for this brilliant reminder of days gone by...Let's see if we can get all the names for this scene please. Apologies in advance for forgetting everyone's names after so long. 40 years ago we were all these bright young kids heading off on a collective adventure. I'd worked my socks off doing chores all year to raise the 10 or 12 quid needed for this and me 'monkey boots'... I look like I'm suffering malnutrition. Photograph taken: Morning of 5th May 1973 (Sunderland F.A. Cup Day). Subject: Stanhope Road Secondary School 1973 Cairngorm Mountain's Expedition. Mr Angus McDonald (Tech Drawing Teacher): Stan Dale (Science Teacher): Parent and child unknown: Dave x (looking sideways); x Johnston: Gary Thompson: Jeff Bell: unknown; John Kirkwood: Alan McKeith: Michael Ord: Mrs Joan Dale (Biologist): Mrs Dorothy Ellis (Geography Teacher). unknown ( Held by Angus) Tim? : Brian Purvis: unknown (Horizontal striped jumper) : Brian Crammon: David Alan: John Kirkwood: 3 unknown females. (It was an all schoolboy trip). Les or Timothy Howe? : Derek Thompson: Norman Stobbs: Brian Taws: unknown (squating right of Brian): unknown: unknown poss. John Gaff ? : unknown female. When this picture was called, I dashed round from loading a freezer box we'd made with Stan during the past few days, and couldn't see past the assembled bodies; thanks to a slight drizzle earlier my hair was already a state before sweating buckets lumping gear around unlike some who turned up later looking like the immaculate conception ...Thanks to the lads for giving me and Dave shallow fruit tins to stand on so we'd be seen, before the lads in front decided to kneel down. Still couldn't see out of the school windows when I left in 5th year! and didn't start growing till 16. Anyone got any clues to names? Or better still...a the picture of the 1974 trip where we discovered beautiful girls could attend. x Johnson = WARREN Johnson. I could be wrong but it looks like him. Some Parka's in that picture eh?